What a lovely hand! Very clear, neat, etc. Though I wish I could read the full sentences. For recreation, I could give you 17th c church court records; the clerks were seriously sloppy at times. My husband used to receive letters from his former adviser, a very famous scholar with abysmal handwriting. When a letter arrived, we'd treat it like an archival document, always working down to one or two words that we needed to do together. Sir Thomas Browne! What do I win? Sadly, the handwriting of the 18th doesn't require mad skillz. I have developed the awful habit of taking lecture notes in secretary hand. Mine is terrible, and it has begun to make even my regular handwriting look way too much like this at a distance. Susan: it's even neater at the beginning of the text--looks like it could be a scribal copy. It does degenerate (this is about 2/3 through the text), though it remains basically tidy and legible throughout. Incidentally, I just saw you cited in an article a grad student of mine was reviewing--quite a surprise when worlds collide like that! AWB (whose comment appeared and then disappeared last night--and then reappeared): you win a big kiss. And lots of reflections on the possible/probable mortality of the soul. Love that you write in secretary hand. That's keepin' it real. Lovely piece. Such a strong contrast of the ink against the paper is cheering. I've been squinting over some rather faded penmanship this past week so this fills me with a bit of envy. I just wonder if you, like me, tend to start off something like this by reading aloud. My husband was wondering what I was doing as I muttered out the first few lines of your text, trying to get into the dialect and other idiosyncracies. . . . I hope the article said nice things about me! Indeed, it appears to be a perfectly cromulent hand. 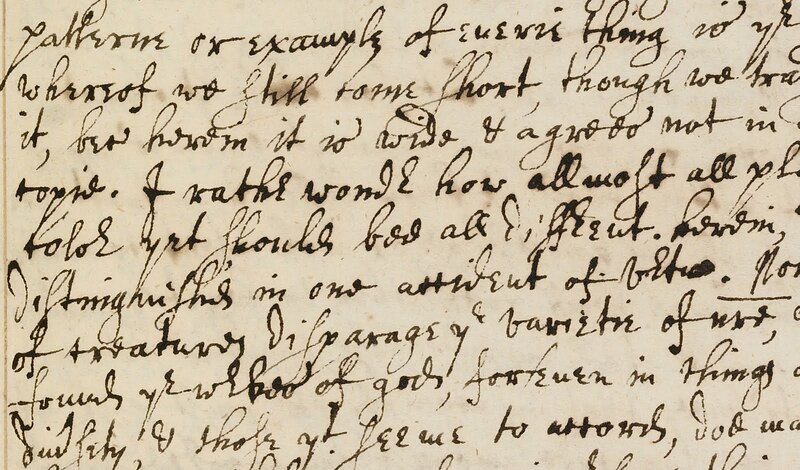 But "the patterne or example of everie thing is ye perfectest in that kind, whereof we still come short"? I think "perfectest" is my new favorite word.